Join up to 30 Historical Romance Authors for a chance to win a $150 Gift Card. Love historical romance? Love prizes? Thirty historical romance authors including Heather McCollum, Alanna Lucas, Tara Kingston, Elizabeth Keysian, Madeline Martin, E Elizabeth Watson, Lori Ann Lori Ann Bailey, Collette Cameron, Eliza Knight, and Jennifer Trethewey have joined together for an Easter Egg Hunt hop. Visit each of the authors’ sites to “collect” the decorated eggs. Collect all 30 eggs for a chance to win $150 gift card! For entry details, and to download your Easter Egg Match form, hop over to the FB event page. So let the hunt begin! Pillage and plunder your weaselly guts out, me hearties! #NewRelease ~ Jenna Jaxon’s Seduction at the Christmas Court, Capt. Jack’s Interview, and #Giveaway! Author Jenna Jaxon is celebrating her #NewRelease, Seduction at the Christmas Court. Hop aboard for a seasonal voyage to 1349 and a Yuletide celebration in King Edward III’s court after Jack has his way with Lady Jenna. ARR!!! Winner of Turkey Trot Blog Hop via Katherine Bone’s #Giveaway! And the winner of the GRAND prize was Laurie who posted on Zina Abbot’s Bridgeport Holiday Bride’s post! Lady Laurie wins the $50 Amazon Gift Card. Huzzah and Hoorah!!! I’m super jazzed to announce that Sherry1969 won my $10 Amazon Gift Card Giveaway! Congratulations, Lady Sherry!!! You’ll be hearing from me very soon! Now that Thanksgiving is over, I’m enjoying eating turkey sandwiches or my rollwich, as I like to call it. I hope your holiday was filled with all that you love. And I hope you enjoyed our Turkey Trot Blog Hop. It was a great deal of fun for me too!!! Of course, I’d be remiss if I didn’t confess I’m extremely grateful to all of my readers and to those who pop in to read my blog whenever they can. And as the holidays pop off to a roaring start, I wish you hours and hours of fun, happiness, time with family and friends, and Happy Reading!!! Turkey Trot Blog Hop and Giveaway by Katherine Bone! Welcome to the Turkey Trot Blog Hop, sponsored by Author Rose Gordon and over twenty authors and bloggers, through November 22-24! Entries end at 11:59 p.m. Central on Nov. 24th so don’t delay! Read on for instructions on how to enter the Grand Prize Giveaway and each author’s individual giveaways. Note: My giveaway is listed at the bottom of this post. Thanksgiving is an American celebration, a day to enjoy the year’s bountiful harvest. I can personally say that I’ve been mightily blessed this year. I’m uber thankful for my rogue, my children and their families, our health, and the FABulous opportunities I achieved in the publishing world. The last book in my Nelson’s Tea Series and the first two books in my Regent’s Revenge Series came out this year. Huzzah! My oldest daughter remarried and we inherited two more grandchildren (AND our first granddaughter!). We got to visit our oldest son and his family in Okinawa, Japan, after two long years. And my rogue and I got to travel to Jamaica for the very first time. A Merry Christmas Military Book Giveaway by Author Donna Hatch! Starting Thanksgiving week, I’d like to share an awesome event that is sure to benefit our military service members overseas. But before I do, I want to thank Lady Donna for her son’s service. Woot!!! And then I want to share that I’m especially thankful to my sons, Air Force and Army, and to you and yours for the selfless sacrifices our dutiful military personnel offer every day of the week. Author Donna Hatch has a son serving in the Air Force and deployed to the Middle East. To honor him and those brave, unselfish men and women who serve in the US Military, Lady Donna is sponsoring a holiday giveaway. Woo-hoo!!! As any reader knows, reading can be a great escape to help ease homesickness which strikes harder during the holidays. Our military servicemen and women are on call 24/7 to protect our interests abroad and make life safer for you and me here at home. To choose the book you’d like to give your service member, click on: Book Giveaway for Military Personnel Drawing. Thank you for your awesome gifty to our military servicemen and women all over the world, Donna! And thank you to everyone who sacrifices their time and talents to keep our country safe here at home! 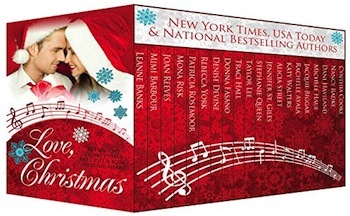 Christmas Book Blitz ~ Love, Christmas and Rafflecopter #Giveaway!